July 15-18, 2018. 3 nights vs the typical week. We drove from Gardiner, MT to Billings on Sunday. On the drive out to Billings we passed a Google Maps street map car! Have you ever seen one of these driving around? We didn’t get a picture of the RV in the glass repair shop. But here is a picture of our site at Billings Village RV park- nothing special, small playground and a few trees but the people were nice and it was only for a few days. One day while we were outside doing school work, the sprinkler came on and it had been broken by the lawn mower the day before so everyone got soaked and Mackenzie saved the computers. It took 1 day for them to replace the windshield- they said it was the hardest windshield they had ever done. We had to let it set for a day before we could drive. Three days total in Billings, MT. Monday, Chris had to take off so he could drive the rig to the glass place leave it there all day so he had no office to work from. 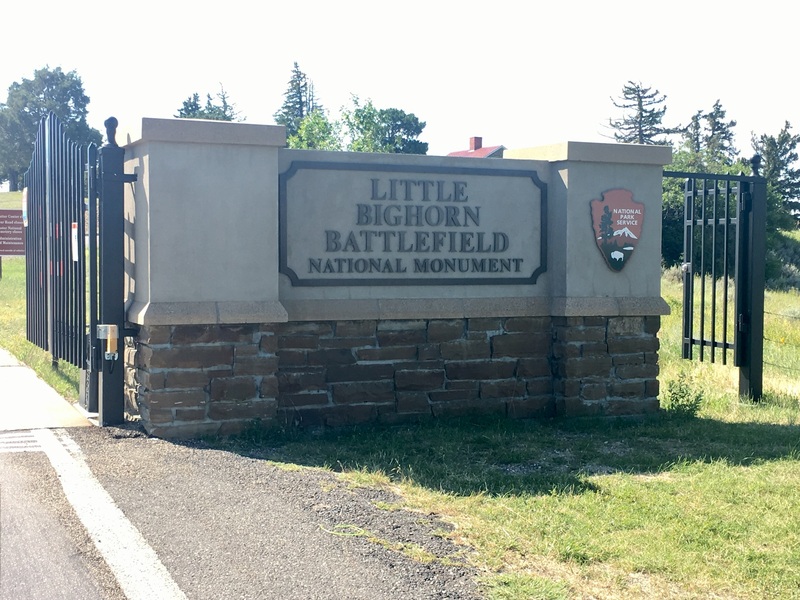 We decided to drive an hour out to Little Bighorn Battlefield national monument while we waited for it to be repaired. This area memorializes the U.S. Army’s 7th Cavalry and the Sioux and Cheyenne in one of the Indian’s last armed efforts to preserve their way of life. In June 1876, 263 soldiers of the US army, including Lt. Col. George Custer died fighting several thousand Lakota, and Cheyenne warriors. We watched the film and then sat on the porch at 11:30am to listen to a ranger led talk. This was THE BEST ranger talk we have ever heard! He made the battle come alive! Tuesday, the girls and I visited a really cool Pictograph Cave. It was only 15 minutes from Billings. If you don’t know; there is a difference between pictographs and petroglyphs. Pictographs are painted and petroglyphs are carved. There are actually three caves along the hike. We saw choke cherries for the first time. This state park has a fee of $6 and has a nice visitors center and junior ranger program. After our hike we had a picnic lunch and visited the museum. While the girls completed their booklets I climbed a tree and read. I had a nice chat with a couple that were actually staying in the same RV park as we were. Small world. Wednesday the girls and I visited the Yellowstone Art Musuem. It was free with our NARM membership. I just love visiting museums for free! They actually built the museum around the old county jailhouse! We were inspired by a student exhibit we saw and the next few days we worked on an art project. They have one of only a few visible art vaults in the country. It was neat to see how they store and organize art pieces that they don’t currently have on display. We thought it was so cool that the building was behind the museum and across the street so we were given a key card to enter at the end of our museum tour. We saw Ant Man and the Wasp at AMC and then had yogurt at Billings Best Yogurt. We were able to do a little shopping this week. The girls have been wanting to do a ‘Worst gift ever’ challenge so this was a great time to do it. We went shopping for bad gag gifts for each other to win the challenge. I had to tell the cashier that we were all going to turn around while he rang it all up and he asked why so I explained… he laughed and while we had our backs turned we could hear his reactions to each gift… it was hilarious. Abby won the challenge with her gift to Mackenzie- it was a brand new book from a series she loves with every other page torn out! The girls also dipped the tips of their hair in blue Kool-aid this week, so when you see their blue hair in pictures for the next month… you’ll know it all started in Billings!